“I want to join the maths coaching class during holidays. But, I have no money” said Alvin. The following day, Alvin saw a strange old bike in front of his house. Harry was chatting with his sister. 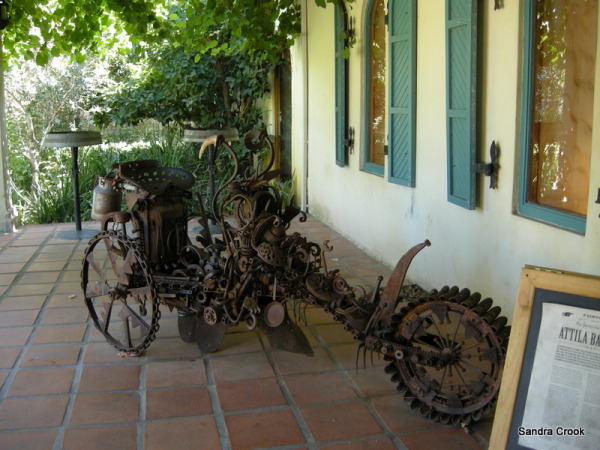 Thanks to Rochelle for hosting Friday Fictioneers and Sandra for the photo. Will he take Harry’s advice..? I wonder what he said…!?! lol. We don’t know where Harry got this bike:) well, as long as he earns money for his maths classes..
What imagination you showed this week! When I was very young, we still had milk delivered to the house in glass bottles; at least I think I remember that. 🙂 Our milkman didn’t ride a bike like this, though!! In the old days in Singapore (1960s), the Indian milkman used to deliver fresh milk on his bicycle – usually in the evenings. What a treat for us kids. Pricked some memories. that bike! well it will take lots of nerve to ride that! A plausible story for using the bike. Lots of imagination in your tale. Interesting and different take on the prompt. ALVIN! Nicely done. Good message too! A groovy thought of the milkman riding around the neighborhoods on this bike! I do believe he may just take the offer out of desperation or as a sign of resignation and acceptance of defeat when it comes to looking for a job 🙂 nice one. I hope he gets to take his class. You have me routing for Alvin. Good job. yes, got it. That’s okay..
Good story I enjoyed readibf. We still have milk delivered to the door, but our milkman drives a small electric pickup – quiet deliveries! Hi, Thank you so much:) Electric pickup..How does that work? Yes, I got it:) Thank you!